Adk Star Ridge Cottage est tout simplement une "paix" du ciel. Situé sur 30 acres privés et serein, il est adjacent à des milliers d'acres de terres boisées vierge. Les voisins sont rares et espacées. Vous pouvez vous attendre la paix et la tranquillité avec les sons et les odeurs de la nature remplir vos sens. Vous pouvez choisir de salon tout simplement sur les 700 sq. pont avec un verre à portée de main et le barbecue griller loin ou parcourir un sentier à droite de la porte de côté pour explorer les forêts au-delà. Le gîte dispose de jeux, des puzzles, sans fil et la télévision par satellite pour ceux qui préfèrent rester à l'intérieur, mais peut encore profiter des vues à travers de nombreuses fenêtres et portes. Hop dans la voiture ou sur vos vélos et voyager à quelques miles à l'Jay 'rapides' où vous pourrez profiter, toboggan et vous rafraîchir dans la rivière Ausable. Visitez le Jay vert, la maison à JEMS théâtre et concerts en plein air et les festivals d'été. Pop dans des commerces de artisans locaux tels que le Jay Studio (sur le vert) & Gallery Youngs (juste en haut Rt. 86) ou prendre une glace au Devins. Après une longue journée sur les pistes ou en randonnée, profiter de la douche à vapeur jacuzzi avec banc intégré. Consultez la page web de la maison pour plus de photos et d'informations. Une antenne d'appoint de téléphone cellulaire ajoute une barre ou deux à votre force de signal pour les utilisateurs de Verizon. (tour locale est Verizon). Interdiction de fumer dans le chalet. Fumer à l'extérieur ok, juste p / u vos mégots! Merci!! Awesome property in a truly spectacular location!!!! We loved our stay for a long ski weekend at this property!!!! The property grounds are just truly amazing. The grounds are immense and are "off the beaten path", which we just loved. Our dog was able to run free with our having no worries of traffic, etc. We walked the driveway frequently during the days of our stay and it was like enjoying a private nature walk. The view at the top of the driveway is absolutely breathtaking. Despite the remote location, supplies are readily accessible at nearby grocery stores, etc. The house itself is extremely well-appointed. We cooked all of our meals but one during our stay and we found everything we needed to do this in the fully equipped kitchen. The house was also extremely clean and comfortable. Mike and Mini are wonderful hosts who put a lot of heart into making their property the perfect "home-away-from-home". We'd definitely highly recommend this property to anyone headed up to this area!!!! Thanks for the awesome review folks. Come on back when you can! We'll keep putting our 'heart and soul' into making the Cottage, Adirondack Star Ridge the 'home away from home' so many have enjoyed. Cheers and thanks again for your choice of stays! My husband, our son and his best friend stayed at Au Sable Star Ridge over the long Martin Luther King weekend. It was a wonderful get away. The cottage was well appointed, cozy and spotless. The owners were easily accessible and attentive to our needs. The setting was peaceful and beautiful! It exceeded our expectations. We would love to go back. Thank you Mike and Mini for sharing your beautiful place with us! It was difficult to leave! Diane & family stayed 3 nights at the Cottage, Adirondack Star Ridge during 16" of snow and temperatures well below 0. We're delighted that the Cottage was a comfortable space for them during these harsh outdoor conditions. Come on back when you can family! The owners are so welcoming, providing al the information we needed prior to our arrival. They checked in on us to make sure we arrived safely and to wish us safe travels on our way out. The home itself is very well kept and clean. There is a wood stove that keeps the house plenty warm, and the owners provided wood and fire starting material) or you could turn on the heat. The steam shower was super nice after a day spent playing in the snow. It has good views from the back porch and breathtaking views of Whiteface Mountain just a short walk up the drive. It was a perfect spot for early morning coffee and nighttime campfire s’mores. We would love to visit again. We have absolutely no complaints about the house, location, views or friendly owners. I would recommend this house to anyone wanting to visit the area. Plenty of heat (from a variety of sources) is just one thing of many we offer in abundance at the Cottage, Adirondack Star Ridge but is especially important when the temps outside can drop well below freezing and our guests are unaccustomed to our Northern Winter weather. There is nothing more satisfying than standing barefoot on a warm radiant floor in your pjs while peering out the double-glazed windows onto a frosty wonderland. Come explore all the Adirondacks is about in the Winter months, then rest up in the comfort of the Cottage, Adirondack Star Ridge. Peaceful and powerful accommodations...highly recommend this property. We were in search of a place that offered privacy as well as beautiful views of the Adirondack area and all it has to offer...and we found it here. Very inviting and relaxing space. We will definitely be back. Thank you! Thanks for your kind and heartfelt words folks...Come on back when you can! Cheers from Adirondack Star Ridge! The house is clean and well kept. It has a huge deck and a propane grill. Good views from the deck. It's in the woods and totally secluded. It's on 30 acres, the owners welcome you to walk up the long driveway which has a clearing (pictured) with INCREDIBLE views (w/ places to sit and a big fire pit too). Just walking the driveway is kind of like a beautiful hike in the woods. The owners are accommodating and friendly. They are located on the other side of the property so far enough away to be separated yet close enough if you should need anything. The house itself is very tidy and well kept. Master bedroom, 2nd bedroom, kitchen and bathroom and a small dining area. Kitchen has a massive very nice counter for eating as well. They have wireless broadband internet. You can make a fire in the woodstove if you want (we did), or just turn up the electric heat. Very comfortable inside. At night, it's dark enough to not only see all the stars but also the Milky Way. Great star-gazing from the deck. Really I couldn't recommend it any stronger. Just a nice place, secluded and private and fantastic. Only about 2 miles from the main road, yet totally in the mountains. It's a really good place. Thanks for the great review folks! Come on back when you can. As you mentioned the wood stove is available with wood provided but as a back up simply use the deliciously comfortable radiant floor heat organized into 3 zones: bath, bedrooms and remainder of the Cottage. We had a great time. The place was clean and the perfect size for us. The ridge view was breath taking and the owners were great to talk to. I would recommend this place to anyone. 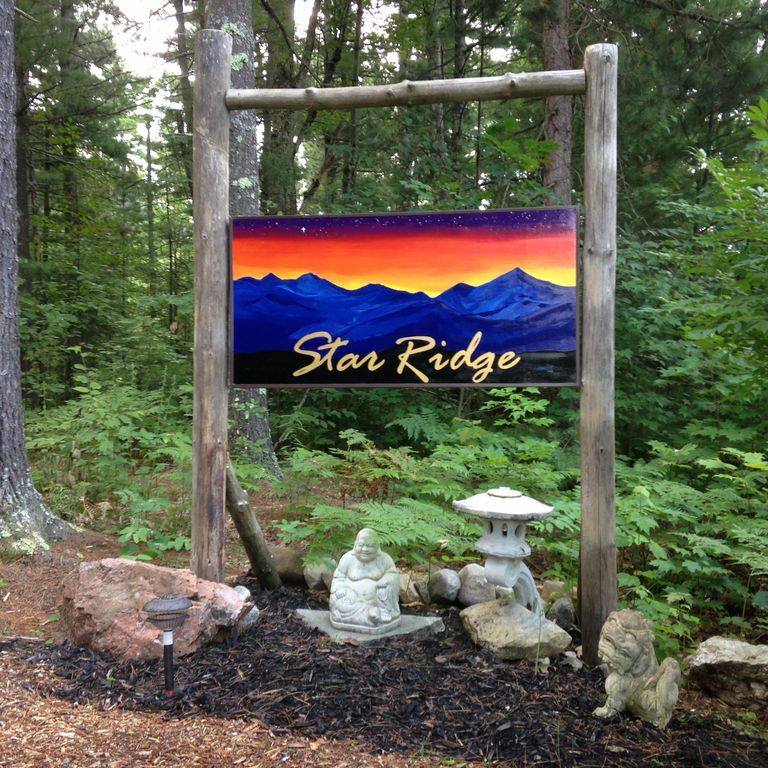 Thanks for the opportunity to share with you our love of hosting and what Star Ridge has to offer among the majesty of the Adk mountains. Mini, Mike and Tierry too! Whiteface Ski Cottage est idéalement situé à Whiteface Mt. (15 min. ), Lake Placid (30 min. ), Région olympique, High Peaks, branches Est et Ouest de la rivière Ausable et dans un court trajet en voiture jusqu'au lac Champlain, Saranac Lake, Plattsburgh et Schroon Lake. Burlington, Vt., Montréal et Lake George sont à 1. 5 heures et faire des excursions d'une journée formidable. Tout près se trouvent Ausable Chasm, atelier du Père Noël au Pôle Nord, High Falls Gorge, Memorial Highway au sommet du mont Whiteface Et la gondole jusqu'à la face Est de Whiteface. Il ya des sentiers pour la randonnée, raquettes, VTT et ski nordique et les rivières pour pêcher, nager, paddle et flotter sur. Activités dans les Adirondacks sont pratiquement illimitées. Littéralement, «le ciel est la limite! Venez séjourner à Whiteface Ski Cottage et d'explorer tout cela et plus vous-même. Tu ne seras pas déçu. One small canine MAY be allowed with conditions---please give us a call or email to discuss the details BEFORE booking. PET FEE WILL APPLY Rates subject to change during holidays and special events for holidays & events. We accept personal checks in US$ as well as credit/debit cards via PayPal (no membership required). CLEANING FEE: $85.00 PET FEE: $100 ABSOLUTELY NO SMOKING within the cottage. Smoking permitted on the deck ONLY.